Blair: Is it fair to burden the taxpayer? Tonight: the Prime Minister on the issue which could make or break his tenancy at 10 Downing Street. 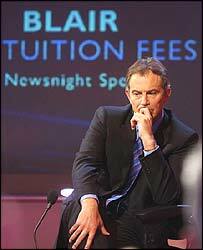 He stakes his political authority on introducing variable university tuition fees. Parliament votes next week - right now the votes don't look as if they are necessarily stacking up his way. Tony Blair is here, and tonight will be questioned by parents, children, students and educational professionals, all of whom have real worries about his plans. Now here is where we are. Everyone agrees that Britain's universities are short of money. Perhaps as much as £11 billion short. The Government plans that from 2006, they will be free to charge students up to £3,000 a year, unlike now where students pay £1,125 up front. They would only have to pay the money back after they start earning £15,000 a year. The Government plans to soften the blow for students from the poorest families by bringing back maintenance grants worth up to £1,500 a year. In addition, they will be giving poorer students £1,200 off their tuition bills and forcing universities who do charge the full £3,000 fees to give bursaries. Prime Minister, before we hear from the audience, are you at all embarrassed that, as somebody who benefited from free university tuition, you are now expecting others to pay for it? It's a result of the fact we have six or seven times as many people going to university. If we want to increase the numbers going to university still further, and we need extra money for universities that everyone accepts we do, it either comes exclusively from the taxpayer, from families, or by graduates repaying something after they graduate. So you are not embarrassed? Until you came into power they got free tuition. That's true. But they had to take out maintenance loans. The reason we brought in tuition fees was, after the report that was set up by the previous government, everyone agreed universities need more money, we need to expand the places, so the question is - how do we pay for it? Are you embarrassed that you have broken the manifesto pledge? We've made it clear we won't introduce this until after the next election. There's an election in between. Also, this system that we are introducing is actually a different system, as you said in your introduction. So that pledge, which only related to the lifetime of this Parliament, should be taken, along presumably with other manifesto pledges, like for example, "We will sustain economic stability", or "We will strengthen our communities", are those only to apply for one Parliament? I hope obviously we make sure that we run the economy well all through Parliaments. But the important thing is, if we have a funding gap with universities, the question is, "How best do we fill it?" The system... Sorry, I want to make this point - when the idea was being talked about at the last election, do you introduce top-up fees? It was simply that the existing fee system should have its cap removed and families would have to pay the full fee on their way through university. Now, under our proposals, no family could have to pay anything on the way through university, they repay it when they are graduates earning money, linked to ability to pay, with a far more generous system of repayment than now. At what point after writing that manifesto in which you requested our votes, did you realise that you couldn't keep the promise? Well I don't accept that we have broken the promise. The new system doesn't come into effect until after the next general election. But if you're saying when did I realise this was a critical situation for universities? When the universities started coming to us and saying, "Look, we literally have a backlog of repairs and infrastructure work running into billions of pounds, we are losing our best academics overseas, the pay of those people teaching in universities can't keep pace with other professionals, and we need more money for the system," then the question is, "Where does the money come from?" What was somebody reading the sentence "We will not introduce top-up fees and have legislated to prevent them" supposed to infer from it? That you wouldn't pay top-up fees this Parliament and you won't. You've just told us that your other pledges, like sustaining economic stability and so on, were ambitions that you hope... that we all hope will last more than one Parliament? That was only for one Parliament too, was it? No it's not, of course, we want to do that throughout the coming years. You can only do that if you get the money into universities that you need. So we should have read the manifesto in its totality? You should have read the manifesto, recognising we won't introduce top-up fees this Parliament, for the next Parliament however, if we are re-elected, we will have an entirely new system that reintroduces maintenance grant for the poorest students, and has no-one paying money up front. That's a quite different system from varying, with a top-up fee, the existing fee system. Andrew Fisher, you are a student and a member of the Labour Party. You didn't by any chance canvass for the 2001 election? Yes, I did some leafleting. My question to Mr Blair would be, you said two and a half years ago, that's when the manifesto was published, that you were against top-up fees and you had legislated to prevent them. You are now talking about people who agree with that policy now opposing you in Parliament, you are telling them they are betraying the country. How can you rectify that with what you are saying now? You are betraying what you said yourself two and a half years ago! How are they betrayers? The existing fee system is that you pay the money going through university, and there's no maintenance grant. What we are introducing - and it only comes into effect after the next election - what we are introducing is a system where no family has to find the money as they are going through university. If you like, it's akin more to a graduate tax in the sense it's repaid only after graduation, and it's repaid according to the ability to pay of the person who's graduated and so, whereas at the moment, for example, with a maintenance loan, somebody on £18,000 or £20,000 a year pays back £17 a week, under our system, combined maintenance and fee, they only pay £8.60 a week. You are making the poorest worse off. At the moment they don't pay tuition fees up front. The bottom third don't pay tuition fees. Now you are introducing a system where they are paying tuition fees of a higher level for three years. That's not benefiting the poorest. Because of the reintroduction of the maintenance grant, and because the universities provide a bursary of up to £300, there will be a £3,000 support package for the poorer students which will mean that covers the entirety of their fee, if that's the way they wish to spend their money. We'll explore this debt question in greater detail in a moment or two. Mandy Telford, what do students understand that manifesto to mean? Students understand that manifesto to mean that this Government would not introduce top-up fees. It's an incredibly complex argument and what you are saying, Prime Minister, I don't think makes sense to many students. Whether it's upfront or back-ended, you are tripling student tuition fees and allowing universities to vary them. That is top-up fees, ultimately. Let me ask you this, Mandy - do you accept the universities need more money urgently? We have always said that universities need more money urgently. How are you saying we should get that more money? The National Union of Students has a clear policy. We don't believe it should come from students, we believe it should come from taxation. Can I just come back on something you said earlier? You realised that you had to introduce some sort of funding system for students because the universities are saying to you they need more money. They have already said, Prime Minister, that £3,000 isn't enough. They need at least £5,000. That's what worries us. Can I come back on this essential point. In the end, what you are illustrating is the point that I'm making, the trouble about Government is you have to make difficult decisions and the money has to come from somewhere. At the moment, the fact is the taxpayer - I think a lot of people don't realise this - they fund every student at university to a greater degree already than they fund secondary school pupils or primary school pupils. Now, if we are to put even more money into universities, is it fair that the general taxpayer, the majority of whom have not been to university, funds that in circumstances where all we are saying is the graduate once they graduate, they pay nothing on the way through, once they graduate they make a payment back to the university system? That seems to me fairer. Let's explore this question of the debt you are going to be saddling graduates with. Are you are seriously telling us that the imposition of these fees will not deter pupils from poorer backgrounds from going to university? When did you start believing that? You didn't used to believe that? I'm going back to 1994, when you were speaking at the launch of the Commission on Social Justice, "Such a system of recovery may deter young people, especially those from poorer backgrounds, from entering higher education. It's for this reason the Labour Party has always rejected it." Exactly, and if you look at the evidence of what has happened, in Australia, New Zealand, Canada, and other countries that have introduced such fee systems - sorry, if I could just finish - in particular those that have introduced graduate repayment schemes, actually the participation, particularly from students from poorer backgrounds, has gone up. In addition, we have our own experience. Remember, everything that's being said now was said when we introduced tuition fees in 1998 and people said, "You will deplete the number of people going to university." It hasn't happened. You say look at places like Australia, we have looked at what's happened there. The Australian Government's own research shows that applications from males from poorer socio-economic backgrounds to the more expensive disciplines at universities, when they introduced top-up fees of the kind you are proposing, they fell by 38%. Having talked to the Australians about this, they would powerfully disagree with that. This is their own research. I would like to check before I accept that. In the talks we have had with the Australian Government, they have said to us that participation from all backgrounds has risen. If you talk to the New Zealand Government, they will tell you that participation, and in New Zealand it's now the highest in the world, has actually risen. The reason for that is perfectly simple. If you are a student from a poor background, you know that you are going to get £3,000 per year, upfront support, plus the fact that what you pay back afterwards will be dependent on the amount of money that you earn. Surely that's a huge change to the benefit of the student? Is it not the case that your own research before you started trying to introduce this policy showed that pupils from poorer backgrounds would be deterred from applying to university? People will no doubt say this. Everybody worries about debt. I understand the worry about debt. My question was whether your research showed that? But the question is, have they in fact, through the introduction of maintenance loans and fees, been deterred from going to university? The numbers have carried on increasing. All I'm asking you to accept is that of course there's a problem with debt, it would be good to give everyone everything for free, that would be fantastic. But I say to you that the debt repayment under our new proposal is going to be far more generous than the existing scheme, it has a cut-off date after 25 years, that's true, it has a cut-off date after 25 years, so it means for example, if someone leaves university, gets a job and then, for example, cares for a relative and doesn't work, or becomes unemployed, the debt is written off after 25 years. That is actually a more generous system than the existing student loan system. Let's hear from someone in the audience. Ashley Gavin, you wrote a letter to the Prime Minister, and I bet you're too polite to quote the particular sentence I'm going to quote now, in which you accuse him of being a liar, because this wasn't in the manifesto, it was ruled out in the manifesto. Just in case the Prime Minister didn't see this letter, perhaps you could read him the fourth paragraph of it, "The threat...". "The threat of a huge debt when I finish university certainly made me think twice about going. If this bill is passed I will have to consider going to a university nearer to home so I can live with my parents. The universities near Bolton are not considered very good for the subjects I'm thinking of taking." My answer would be to you that if you look at the package that we are giving to people, I mean, it depends what income background you come from, but if you are in the poorer 30% of families, you will have the £3,000 package, which would cover the cost of the new fee if you wanted the more expensive course. And, whatever you take out by way of maintenance loan or by fee loan, you will pay back at a far more generous rate. You only pay any money back, you and your family will pay nothing as you go through university, but you'll pay back money once you graduate according to how much money you earn. If, for example, you are earning £20,000 a year, you will pay a certain amount of money, if you are earning £30,000 you will pay more. But you won't have to pay anything unless you are earning money. No, I'm not. It's still a lot of money. I would rather pay the smaller fee now than have the huge debt when I come out. Well you can obviously¿ If you come from a poor background - I don't want to ask your family income - but if you come from a poorer background, you will get a maintenance grant and a fee remission and a bursary from the university that will add up to £3,000. The difficulty is if we... Look, what we could do easily, I agree, we could do what Mandy has asked and say the whole thing comes out of general taxation, but is that fair in circumstances where you will do better as a university graduate, and earn more money - graduates earn around 35-40% more than non-graduates - is it fair to make people on low incomes who haven't been to university pay more money for that to happen when we are already paying... the Government will pay for you as a student more money when you graduate or go through university than are paying for you now when you are at secondary school? Hang on a second, Prime Minister, according to that argument, if you were in good health and never got ill, you wouldn't have to pay for the health service? The health service I think is something that everybody accepts that everybody needs. I thought higher education was supposed to benefit the whole of society? Well, it benefits the whole of society, but not everyone gets a greater income as a result of having gone to university. Everyone gets better health from having been treated in an NHS hospital? I agree with you, what you can do? Let's be honest about this, is say all the money comes out of general taxation. But it would mean that any additional money that I'm raising in general taxation goes to give an even bigger payment to students rather than, say, to primary school or secondary school children or the seven million adults in this country who haven't got the basic skills and have to pay if they go and get the basic skills. Cynthia Gilbert, tell us about your experience - you're a single mother? Yes I am. I would like my daughter to go to university. My income is very low. But the idea of sending her to university and having to send her out the door with a debt is very scary for me as a parent, you are a parent yourself, to push your child out into the world and yes, she will graduate and yes, you are saying it's 30% better chance of her getting a decent income and all the rest of it, but to push her out of that door with a debt, I can't see it. The fact that you are saying - I have to say this as well - you are not going to pay nothing all the way through but at the end of it... what's the difference? What is the difference? You are still having to pay a debt. There's a debt there. Sure, but there are two things I would say, first of all you probably will qualify for the £3,000 a year support, so that will mean that your daughter gets £3,000 a year in support. Does this mean it will cover everything that I'm thinking about, books and all the rest of it? It wouldn't even cover the tuition fees. Hang on. Let's be honest about this, it will certainly cover the tuition fees of £3,000 because it's a £3,000 payment. Correct, it wouldn't cover all the maintenance loan. She will have a debt for that. But then she has that under the existing system. It's surely fairer, rather than having you find the money upfront now, that when your daughter gets a job and graduates, she pays back - as I say, it's with no real rate of interest on the loan - she pays back a sum of money per week, out of her earned income. Isn't that a fairer way of doing it than forcing you to pay now? I don't think so. Either way it's a debt for the family isn't it? My daughter will be staying at home. I don't know if she will be going away. It's my problem because she is my daughter. It's my responsibility. Of course. Can I ask you - you were saying when you graduate that you will have to pay back the debt, don't you think that will stop a lot of people from actually graduating and maybe doing just two years, because you have to pay back your debt. I just thought about that while you were talking. I don't know? I think people are more rational and they think of what a university degree gives them, they will think it's a good idea to get that degree. I say to you, I hear what you say, but I suppose you would like me to find this money out of general taxation? Well, that's the argument then. Single mother, Rochelle Clifford behind, you have five children? Yes and I have two daughters in their final year at university. You are correct, the interest rate on the money that they have had to borrow thus far is minimal. Philip sitting next to me wants to go to university, he will come in under this new tuition fees business. Between him and my daughters, in a very short space of time, they could be somewhere in the region of £90,000 in debt. I can't justify that. I don't think you can justify it either. I don't think any young person in this country should be forced to start their young adult life with £30,000 of debt hanging round their neck. I accept as a parent that the probabilities are that we will have to remortgage our home to prevent our children having to start their lives saddled with this humongous amount of money. Can I ask you a question - do you get any fee remission now? I get a slight fee remission because I have twins. Therefore it's divided. There is a reasonable amount of fairness in that. But they are loaned up to the hilt. That's the maintenance loan, presumably? Yes and the overdraft facilities at the banks facilitate them so they can eat and buy their books and have their internet connection. Because without a telephone line they can't get the university stuff downloaded. It's a business, Mr Blair. University is more commercial than any other business. I appreciate that. Surely the point is this - they have a maintenance loan now. I totally understand... Look, let me say something to you. The easiest thing to say as Prime Minister is yes to everybody. The easiest thing to say is we will give you the whole system for free. But I would then have to find £1 billion in money from elsewhere that I would have to put into that. I couldn't justify that. I think it is unfair to ask general taxpayers, as I say, 80% of which have not been to university, when you have got an adult who perhaps wants to get an additional skill and they have to pay for it if they don't go to university, to say to those people we are not giving you education for free, to say to under-5s where we are desperately short of investment in the under-5s now, to say to you primary schools where again we need more money, we are going to put an even bigger subsidy into university students. Believe me if I could say to you, "You can have it all for free," I would love to. The fact is people who go through university at the moment when they have to pay the fee upfront they won't have to pay it at all. They pay nothing on the way through. Given that we are introducing a far more generous repayment system than the existing maintenance loan, it's not a bad thing to say to a graduate, pay a little bit back into the system. Can we hear from other people in the audience. Lawrence Morton. You are a head teacher? I am, Jeremy. Prime Minister, we had a culture shift in our socially challenged economic area. We managed to persuade students to value their education and aspirations were much improved by educational opportunity. The introduction of tuition fees without maintenance grants and upfront frees, did have that effect of setting back the progress we were making. My concern now is that you must make sure that if the dust settles round this and you have your way, that your Government doesn't sit back then. It must give clarity to every group of students and must give confidence back to the young people in this country that they can afford to go to university, and they must be guaranteed now that you will have a commitment to good quality education when they are at university. I hope you'll monitor all of these things. Well, we will do. I think you are absolutely right in saying that we both need to expand the access, and we need to improve the quality and my worry is we want more children to go to university and what we want to do is make sure they are getting a high quality education. Now, I hope that for children, as I say, from those from poorer backgrounds, the reintroduction of maintenance grants and the fact there's support and fee remission and so on, should make a difference, plus the fact they don't have to find the money as they are going through university. It's a good start. But I think you need to address a lot of the problems about the psychological barrier of the final debt. And I do understand that. I do understand that. You are from the other end of the spectrum, aren't you from your family? I'm not from a very rich background but I'm from a middle class background, where the majority of people in Britain are. But I'm feeling that I have a lot of debts to pay off if I go to university. I'm wondering how the Government is going to help the majority of people in the country? By making the system far more generous than it is now. If you go to university now, people are shaking their heads but there are facts in this. The fact is that most students take out maintenance loans now. So most leave university now with a debt of, it could be £10,000 or £12,000 maintenance. At the present time, that debt is treated more like a mortgage debt, in the sense that you pay until you are 65, and you really have to pay quite large sums of money on quite modest incomes. What we are doing is changing that system so that yes it is true your combined maintenance loan and fee will be more, but the system of repayment will be far more generous on your early years of earning money, and there's a cut-off point after 25 years with no real rate of interest. Now, I think that's not a bad deal frankly. Julia Prague, you are a medical student, aren't you? And you presumably have already got considerable debts, have you? At 19 I'm already over £10,000 in debt and I have only done a third of my course. So, what is your worry here? Well, I'm from an average middle class background. I went to the local comprehensive. I am the first in my family to go to university. I think it will be students from my sort of background who will be most deterred. They will know that they won't get any help, any financial help, such as you are suggesting for the poorer student, they don't have vast amounts of inherited wealth to call upon. And therefore they will be particularly... they will be deterred from especially doing the long courses such as medicine, we can't afford for the number of medical students to reduce. We are in huge shortage of doctors and it will be the middle class students who will be most pushed away. Can I just try and deal with the middle class point. I think I'm right in saying, correct me if I'm wrong, for your later years for your medical course you actually get the fees written off? In our final year. But if you say that you have changed your mind on top-up fees so, maybe I'm only in the second year and if I get to my fifth year then it might change as well? On the assumption though that you go through university now and you are paying upfront fees, surely it helps middle-class families that the system of repayment is going to be far more generous? Yes, but when I graduate I will have £30,000 of debt at the moment. Under the new scheme a medical student will have £40,000. When am I supposed to have a mortgage, when am I supposed to feed myself and...when am I, heaven forbid, have a social life? When am I...heating my house, eating, whatever? You know. My salary will not be that big. On crude calculations that I have done already, a pension - a state pension is, you know, not much to be desired. My student fees and also a mortgage that will come to over half of my potential salary per month. You are only going to be paying at a reduced rate from what you'd pay the loan off now? Doesn't that give you something...? Last year my student loan covered my halls of residence fees alone, that was it! Where am I supposed to get the rest of the money from? If I'm working as a doctor, I'm going to pay this hopefully off in about 12 years. And if you encourage a system where you say, if you get to 25 years and you haven't paid it off, forget it, your income is much less than your outgoings and that means debt. You cannot encourage a Government system whereby your outgoings are more than your incomings. It really infuriates me that you say, "Why should the dustman fund the doctor? ", when he has the heart attack he will be pleased that I went to university and graduated as a doctor. Therefore he should contribute towards the cost of my degree. I'm doing a social degree - a degree that will help society. We cannot not have doctors. Yes, Julia, but with respect, so are the people who work as ancillary porters and cleaners in the health service too. They are doing a social job. They won't incur £18,000 of debt in order to be a porter. I know but you will be earning a very great deal more as a doctor than they earn as a porter. I'll pay more tax. I'll pay more tax back. You will because you are earning more. And this is the heart of the argument. The one thing people cannot escape from this and I'm sorry to be hard back with you, but what people cannot escape from is that the money has to come from somewhere. If it doesn't come from the system that we are describing, it comes from the general taxpayer, including people who will be on far lower incomes than you will be earning as a doctor, far lower incomes and they will have to make a greater contribution and is that fair when they have got all their bills and their mortgage to pay? But Prime Minister, let's look at this question of the level at which these fees are set. Even under your proposals you will not meet the funding gap that exists in higher education. You say the gap exists, you don't propose to meet it by the imposition of these new fees, what are you going to do to meet the gap between what you raise through tuition fees, a billion pounds perhaps, and the estimated gap of £8-10 billion? It's a good point but the answer to it is the universities will be substantially better off. Are you going to tax the kitchen porter, the hospital porter and the dustman and everybody else to pay for it, aren't you? Well, sorry, you are coming at me from the opposite direction. No, we are not having to increase that because we are actually managing to find greater income from fees. But it is absolutely true that we face a situation where as increasing numbers of people go to higher education it will be harder and harder to fund it. Look, that's why this argument is not just taking place in Britain today, it's taking place in literally every single developed country around the world. As I say, I would love to - it would be the most popular thing a politician could do, to say that you can get everything for free, but you can't. Even with the additional amounts of money coming from the universities by way of fee, the taxpayer is still, as I say, making a bigger contribution to university education than they are to any other point in the education system. Let's look at the level of which the fees are set. You say this question of variability is absolutely critical. Charles Clarke told us on Newsnight, a couple of weeks ago, he said he would bet his mortgage that the £3,000 limit would still be in place in ten years' time. Would you bet, say, the mortgages on your students sons two flats in Bristol that they would still be in place in ten years' time? All I can tell you is that it would require parliamentary approval from both Houses of Parliament to increase it. And the commitment has been given that it won't be increased within the next Parliament. And that's actually going to be - the parliamentary approval point will actually be in the bill. So, the point that you are making is absolutely right. There are still funding gaps with the universities. But my point is that we are significantly improving it. There will be 30% per student more... Let me just make this point to you as I don't think this has come out so far. For universities in this country, and we have got to take account of this, this is right at the cutting edge of the future of this country, university academics are probably the one group of professionals in the country whose salaries have barely risen in line with inflation. They are the one group of people across the public service you can say that about. OK. Well, let's hear from one of these impoverished academics. James Tooley, you are an academic at Newcastle University. Is the feeling in the academic community that these fees can, in any sense for any length of time, stay at £3,000 top? No, I'm inclined to think, Prime Minister, with all due respect, that Charles Clarke will lose his mortgage. The talk in the senior common rooms is that the £3,000 limit will not remain for very long. And I'm very happy with that. I enjoy most of what you have to say. I think the £3,000 limit is a limit that needs to be exceeded soon so that universities can invest more in high-quality education. But the way Jeremy has been phrasing the questions in a sense, it's as if the universities are totally dependent on Government for everything they do. But actually partly through your reforms and other reforms, we are becoming more innovative and more entrepreneurial, and so on, and so we can raise money from various sources. So, you agree with what he is doing, you are pleased? I don't like the idea of the new regulator. I think this is the downside. OK. Let's leave the regulator out of it. Are you pleased that students are going to have to pay more for their tuition? I don't know what you're doing here, then! Exactly right. It was supposed to be a moaning programme. No, it's him trying to persuade his critics. So do you think the cap will go up? Dr Goldstein, you are the Vice Chancellor of one of the new universities - the University of Coventry? Well, it's been around for about 160 years in one form or other. But, yes I know what you mean, Jeremy. Well, we are concerned about the issue of debt. I just want to come back to that. Because I think the Prime Minister is saying that if you're debt-averse, don't worry, we will give you a maintenance grant and you can spend that on your fees. And that doesn't seem to make any sense. You can't have it both ways it seems to me. If it's a maintenance grant, it's maintenance not for actually paying fees. So, I think one has to be careful. The second thing about debt, sorry to take you back to that, but all the research in the UK suggests that debt aversion is a big issue, particularly amongst the socioeconomic groups that this country, this Government quite rightly wants to attract and I haven't seen anything at all in the proposals that addresses that. Can I just ask you on the question of from where you sit as opposed to where someone at Newcastle University sits or Oxford or Cambridge, or wherever, are you worried about the creation of two or more tiers of universities? Of course. If we have a situation in which the cap goes, and even with the £3,000 gap, we will find that those students that are less debt adverse will go to universities that are charging higher fees and almost to hell with the rest. The problem being, of course, that variable tuition fees means a variable amount of resource that universities have to spend on their students' education. And that's what we are trying to do, improve the quality, as well as the volume of education. And if, if, the university attracts students and works hard to attract students from less well-off backgrounds so that loans that are more debt adverse, then it won't feel able to increase its tuition fees to the required extent. Are you worried about the creation of a tier or a league table or something? Let me deal with both points. I mean, I think it's fair to say actually most of the universities are in favour of what we are doing. But I totally understand the point that you are making. I was actually talking earlier today, with the University of Teesside which is I don't think dissimilar in its make-up from your university. In the end what they said was this, that they have come down in favour of the proposals because they do believe that the £3,000 package of support will help a lot of the students that go to universities like yours. Look, I don't - please understand one thing - I do not at all disdain the issue of debt or say it's not an issue for people, it is. But that's why we have tried to take account of those concerns by making the system of repayment a lot more generous, and by saying to people in effect, look, you can take this either by maintenance or by fee remission if you want to. People have got a choice on that. For the first time, if they want to take, effectively, a £1,500 maintenance grant, they can take that grant. I think that will be of some help in getting them through. I have no doubt at all, and if I can just come back, I have no doubt at all that these proposals will be better in removing upfront fees and replacing them with a contribution system. But, but, yes, but we heard the answer to that, but, I think you have not addressed the issue about funding universities that attract, and work hard to attract, students from broadly working class or less well-off backgrounds. Because those institutions will not be able to raise the funding they need. And when tuition fees were introduced in 1999, the actual public funding for universities went down. We have only got constant funding per student for teaching because of the introduction of tuition fees. The implication of that is that if universities aren't able significantly to raise their fees because of their student population and profile, they will actually be getting less money per student in the future. And I don't think that has been addressed by the Government. Well, can I answer that because I think that's an important point. First of all I assume, Mike, your university will benefit from the widening access fund and grant, which as you know we are increasing to £250 million a year. At the expense of the average unit of funding, it's only shuffling money around - yes, my university marginally benefits overall - marginally. You must get more money out of that. The other point is this - this is the argument on variability. We face a choice there, you either say that you are going to set a higher fee for all universities and all courses, or you give universities some flexibility. The reason that we in the end went for flexibility was for the reason given by many of your colleagues which was to say, look, don't force us to charge the same for every course, because some courses will be different. And I was talking to a university vice chancellor the other day and he was saying to me, "For a law degree we will probably charge the full £3,000. But for degrees where we want to attract people we will drop the fee significantly below that." And so in the end we had to decide were we going to go for a variable fee or not. And I have to say, the overwhelming impression from the universities¿ I mean I agree, and understand you don't agree with it, but the overwhelming impression for the universities, was, "Don't force us to charge more than we want to charge for certain courses." This takes us very naturally to the question of why you want 50% of school leavers to be going to universities. I mean you keep on saying that all the top countries in the world send 50% of their school leavers to university. Well, for example Scotland, actually sends 50% of their under 30s. I don't know whether they are sending them outside these islands. No, countries outside these islands, because actually the UK has a higher entry rate to universities than many others, Germany - 32%, France - 37%, United States - 42%, Japan - 41%. This is an absolutely fascinating point, you say Germany only sends 32%, and yes why are the demonstrations going on in Germany, at the moment, over university finance? Because they realise that the current system in Germany is not widening access and participation. Finland, New Zealand, Australia, these other countries are getting more people coming into them. So, the comparison is with Finland, is it? The comparison actually is with those countries who have been increasing the numbers of people going to university. And let me just say, a lot of people say, "Why on earth do you have the target or aim of 50%." The answer is, if you look at what determines whether children go to university or not, actually the biggest determinant is whether they manage to get decent A-levels. And as schools improve their results and more and more children get decent A-level results, then more want to go to university. And I think it would be quite wrong to stop them or arbitrarily to cut the numbers. James Avery, what's your take on this? You want fewer people to go to university? Well, I'm afraid I totally disagree with you. And you tell me which young people you are going to turn around and say, "You don't deserve a university place". And what's more you are going to be saying, "You don't deserve a university place because actually your family isn't wealthy enough." No. He is not arguing that. He is arguing appropriateness of education. Yes we can argue appropriateness of education. But, surely it's right if a young person wants to go to university and the university is able to offer them a place, that they are able to go there. And If you talk to Lawrence or Mike who are actually dealing with kids from these backgrounds, they would want them to go to university. Where I agree with you totally is, this is important, it's the heart of the argument. Adult skills is also a huge issue. That's why we are putting more money into modern apprenticeships. That's why we are trying to put more money into adult skills as well. But it's not a reason for preventing young people from going to university. I'd just like to say I do support the Prime Minister's target. I think it's very important that he widens access but a key issue is that he is bringing a market into higher education, where he is making students pay according to their bank balance and not their brains. Is that fair from a Labour Government who supposedly commits to social justice? Isn't it fair that you say the student pays nothing on the way through but that afterwards, according to their bank balance, as they do in relation to general taxation, they pay according to their means to pay? But afterwards Prime Minister, graduates on £20,000 will face a marginal tax rate of 41% - 23% income tax, 9% loan and 9% fees. That's more than you, is that fair? It's surely fair if the only alternative, and you agree with me, of getting more money into higher education is to make the general taxpayer pay it, even though they are not benefiting from higher education. And even though they are already funding higher education to a far greater degree than at any other stage of education in our country? I can tell you what the other alternative is. Well, during your tenure as a Prime Minister you have handed something like £11 billion a year tax refunds to the big corporations in corporation tax, that could go on higher education. You could have progressive taxation or you could up the taxation on those over £100,000. Not the dustman, make the rich pay. You took that off them. There were other things that we did that actually reduced the amount of money. What happened was that cutting corporation tax was all part of removing - I mean it's a very complicated argument. You've taken from the poor and given to the rich, Mr Blair. There's a bigger difference between the poor and rich here than before. Can I come back on the fact of 50% you want to go to university but is that not just lowering standards by accepting 50% that might not be good enough to go. David Frost also speaks of this point so let him augment it. Go on. I think the concern from business is exactly that. What they are saying to us is the skill levels are lying at the technician level, they are lying at the vocational level. Why are we encouraging this magic figure of 50% into higher education? What a number of employers are saying to us, clearly a view from earlier on, is that many of the gradates that are coming out are really not capable of the very basic skills that are needed within business. What this Government should be clearly doing is not just pushing the traditional three-year undergraduate route, but we should be placing much greater emphasis on vocational trading, on the technician level within business, that is the requirements and that's where the skill shortages lie. But David, we are doing that. The very reason why you have got now 230,000 a year going into modern apprenticeships and why universities like Coventry will be taking a lot of people doing highly vocational skills at that university is because we see the need to do that. Let me just make this clear, we are not lowering standards at all by saying more people should go to university. We are making a prediction, in a sense, and saying as the numbers of young people getting good A-levels increases, there will be over time more that want to go to university. That's why, as you said, when I was a young person, probably 6 or 7% of school leavers went to university, now it's 35%. We are not saying to universities you have got to take these people irrespective of their ability. What we are saying to universities is the opposite. If they have got the ability, you should have the finance to be able to take them. That's the problem. Prime Minister, has it occurred to you when you look at this issue that one of the problems you have got is that people are, how shall I put this - not inclined to believe you, because they feel that you have misled them already in the recent past over the question, for example, of war with Iraq, and the problem is a broader one of your own credibility? In respect of Iraq, I know the Hutton report will be published next week, but I'm happy to answer questions on that, and in respect of trust generally, I suppose there's always an issue. They don't trust you any more? It's a question of whether people trust us to do the right thing for the country in circumstances where I think probably most people here would say, yes there's a problem with university funding but then there's a general view that's been expressed by your audience, but I'm not sure by everyone outside, that it should come from general taxation. And what I would say to people is, in the end there's a choice and I have tried to balance the interests of the general taxpayer, with the interests of the student. I'm saying that already the general taxpayer funds the vast bulk of the money that goes into universities, but it's not unfair to make a student pay when they graduate according to a fair graduation repayment system, and surely that is a better way of doing it. But next week is more or less make-or-break for your Prime Ministership, isn't it? It's going to be difficult. I can't remember the last week that was my most difficult week, and it was the week before last. But they come around pretty regularly, as you know, but that's part of the job and you have to do what you think is right. I know a lot of people disagree with me over Iraq. But I believe it was the right thing to do and I know a lot of people disagree with me over this. I'm trying to do the right thing. You have the vote on this in Parliament, you have the Hutton report, are you entirely sure the end of next week you will still be Prime Minister? Well, I'm going to do my best, aren't I? To win the vote, and I can't tell you what the Hutton report is going to say. There's no point in speculating about it. But what I do know is this - that the only point in doing this job in the end and look, you never please all the people all the time, and sometimes you please very few of the people any of the time, but there's no point in doing it unless you do what you think is right. Look, this tuition and university finance argument, I agree it's a very difficult argument. But I'm not the only Prime Minister around the world today having to make this argument. And, actually when you read that figure out from Germany, just realise that the idea that only 30% of your population should go to university, I don't know a single developed country that regards that as acceptable. They don't in Germany, that's why they're having a debate about it. The reason why the United States of America at the moment, spends twice per person on university funding is they have a different system of doing it. I don't want our country to fall behind in the future when what we need is more education in this country, not less, and when we are not just having to fund school education, we are having to fund it throughout life. And you are confident you are going to survive this? I believe I will survive it, yes. Prime Minister, thank you. Thank you to our audience too and thank you for watching.